6/6 Cup of Coffee: While many of the eyes of the baseball world were focused on the first day of the draft there was a lot of baseball being played. After falling in extra innings in the resumption of Wednesday's contest, Salem got an excellent start in the nightcap from Justin Haley (pictured) to salvage a split. Portland rallied in the late innings, the DSL Red Sox battered their way to victory, and Pawtucket fell in a pitchers' duel. A day after ending its five-game losing streak, Pawtucket went back in the wrong direction in a 2-0 loss to the Durham Bulls (TB). Steven Wright was excellent in his second start of the year for the PawSox. The knuckleballer fired seven shutout innings, allowing only four hits. He struck out seven and walked three, but came away with a no decision. The Durham lineup finally struck for a pair of runs in the eighth inning off of reliever Dalier Hinojosa. The Pawtucket lineup was held in check all night by Alex Colome (TB), a top prospect coming off a 50-game suspension. Mookie Betts was on base twice, going 1 for 3 with a walk. Shannon Wilkerson was the only PawSox player to reach third base, delivering a ninth-inning triple as part of his 2-for-3 night. Portland came back to defeat the Erie SeaWolves (DET) 5-3. Felix Doubront, on the disabled list since May 21 with a shoulder injury, made his first rehab appearance. The left-hander allowed two runs on four hits in his four innings of work, striking out a pair and inducing nine ground-ball outs. Mike McCarthy followed with four shutout innings. After giving up a double to the first batter he faced, McCarthy went on to retire the next 12 in a row, earning the win for his effort. Erie mounted a rally in the ninth off of Miguel Celestino, scoring a run on two hits, but he was able to quell the attack for his fourth save of the year. With the game knotted at two in the eighth inning, Stefan Welch ripped a two-run triple that scored Deven Marrero and Blake Swihart. It was the second triple of the night for Welch, who went 2 for 4. Swihart also had two hits for Portland, raising his batting average to .302. Matt Spring, who got the start as the designated hitter, left the game in the seventh inning after being hit by a pitch. It turned into a long day of baseball for Salem, who resumed its game with the Frederick Keys (BAL) that was postponed after four innings on Wednesday before playing the regularly scheduled contest. The makeup wasn't resolved until the 12th inning, with Salem falling 9-8. Original starter Simon Mercedes struggled, allowing four runs (three earned) on four hits in 3 2/3 innings, walking and striking out four apiece. When action resumed on Thursday, Nate Reed took the mound, giving up three runs on five hits in four frames. Madison Younginer had a solid outing out of the bullpen, keeping the game knotted at seven with three shutout innings of work. Younginer gave up two hits and walked one while striking out two. The Keys struck for a pair of runs in the top of the 12th off of Kyle Stroup, who took his first loss of the season. Salem rallied in the bottom of the 12th, as Aneury Tavarez doubled and came in to score on a Dreily Guerrero base hit, but that was it for the Red Sox. Despite a 14-hit attack, the lineup was only 5 for 18 with runners in scoring position. Matty Johnson was 3 for 7 with a double and a run scored, leading the charge. Reed Gragnani went 2 for 5 with two doubles, a walk and a pair of runs scored. Guerrero and Carson Blair also added two hits apiece. The regularly scheduled contest had a much different feel, with Salem shutting down Frederick for a 4-0 victory. Mario Martinez delivered a three-run homer in the first, and that was all of the offense that Justin Haley would need. Haley was named to the Carolina League All-Star squad earlier in the week and reinforced that decision with six shutout innings. Frederick managed just four hits off of the right-hander, who struck out seven and walked only one. Dayan Diaz struck out two in a scoreless seventh to close out the win. The Salem bats were mostly silent after the Martinez homer. Mike Miller, who scored on the blast, was 2 for 4 with a double and an RBI. Miller is now 7 for 15 since being activated from the disabled list. The game between Greenville and the Rome Braves (ATL) was postponed by heavy rain. The contest will be made up as part of a doubleheader on Saturday. The DSL Red Sox bats came through again in a 10-4 win over the DSL Cardinals. Despite playing in what is normally a difficult-hitting environment, the DSL Sox have already scored 42 runs in their first five games. The attack was spread out evenly, as all nine starters had a base hit. Rafael Devers drove in two and walked in his 1-for-3 game, and has hit safely in all five games. Luis Alejandro Basabe made his 2014 debut, going 2 for 4 with a triple, an RBI, and two runs scored. Catcher Roldani Baldwin also continued to produce, scoring a pair of runs while going 1 for 5. Baldwin is 10 for 22 on the young season. The offensive explosion made life easy for starter Daniel Gonzalez in his second start of the season. 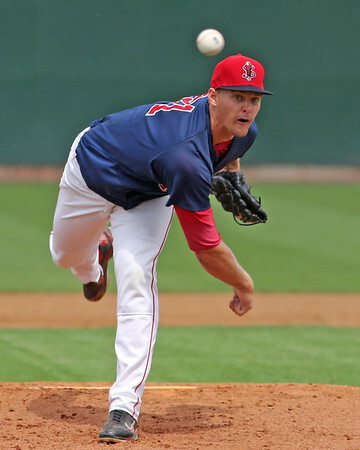 The right-hander, named the 2013 DSL Red Sox pitcher of the year by SoxProspects.com, allowed two runs on three hits in five innings to move to 2-0. Gonzalez struck out six while walking only one, but allowed his first home run in 56 1/3 professional innings. Ritzi Mendoza allowed a pair of unearned runs in three innings, and Carlos Caceres struck out two in a scoreless ninth. Player of the Day: It was another strong outing for Justin Haley, who had his third appearance of at least six innings without allowing a run. The sixth-round pick in 2012 out of Cal. State-Fresno lowered his ERA to 1.96 in the win, third in the Carolina League among pitchers with at least 40 innings.